First an apology: There was a bug in the initial postings of the latest TMC-1 software. This has now been corrected, it was only up for a few hours. As soon as I increase functionality on the TMC-1 or any other product I get requests for even more. I am not complaining though, I am happy that customers are using the unit and are providing feedback. Owen who runs The Bridge Sound and Stage has provided me with good feedback on using the TMC-1 in a stereo music environment. As I have not worked in music studios for 30 years I needed it! 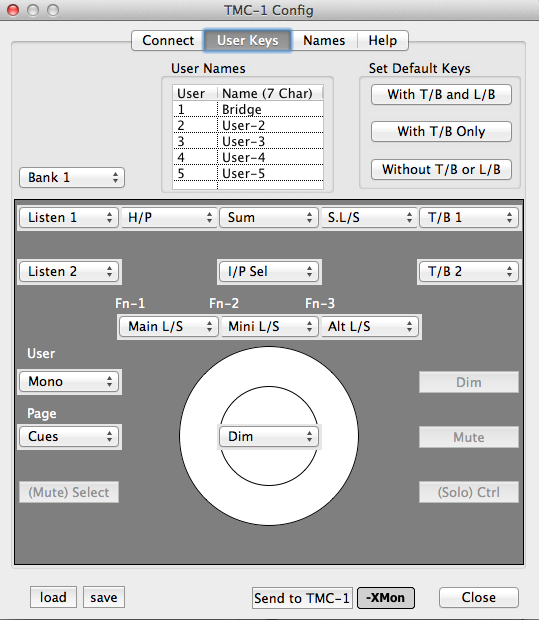 Below is a screenshot from the TMC-1 configuration tool showings Owen's current keyboard layout. Hopefully I will be able to update this in the future - Owen has also promised photo's of his studio.